As the winter snow melts away, skunk cabbage begins appearing as early as March. 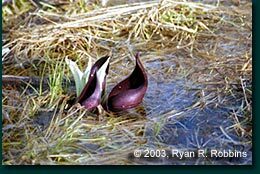 The skunk cabbage is generally the first plant to emerge after winter. In fact, it emerges during winter. This is because it creates its own heat through a series of chemical reactions. The heat – as much as 60 degrees Fahrenheit – is enough to melt ice and snow in the plant’s immediate area. 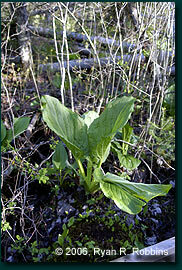 The skunk cabbage’s odor is not noticeable on the outside, unless the plant is damaged. The odor attracts bees and other insects, which pollinate the flowers inside the leaves. Bees will even use the plant’s heat to survive when the temperature drops below about 60 degrees in the early spring. Unfurled, the skunk cabbage's leaves can grow up to 4 feet long. In about mid-May the skunk cabbage’s leaves unfurl and grow as much as 4 feet, resembling cabbage. However, the blooming actually signals the plant’s slow decay on the outside. By August, the leaves will dissolve into a slimy black substance. The flowers reach maturity in September. In the fall and winter, the skunk cabbage is dormant on the surface. But its extensive network of roots continues to feed the plant. Skunk cabbage has no practical use to humans because it is poisonous. American Indians used the plant to treat respiratory ailments such as asthma, “hysteria” and muscle spasms. However, universal side effects include nausea, vomiting and severe burning. Black bears eat the plant in the spring after emerging from hibernation. One theory is the plant helps them flush their digestive system. Ferns appear as fiddleheads in the spring. Ferns are among the oldest known plants; scientists believe they have existed for 400 million years. In contrast to the skunk cabbage, the ostrich fern is perfectly edible for humans in its fiddlehead stage. 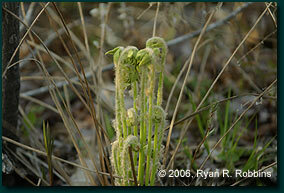 In the spring, the ferns sprout from the ground in a shape resembling a fiddlehead. For years, Mainers have picked, sold and cooked the delicacy. Only in recent years have fiddleheads made their way into supermarkets and restaurants. The fiddleheads appear in clumps in May in damp areas. They unfurl into full-size ferns by the end of June, with their leaves growing as much as 5 feet and resembling the feathers of an ostrich. As soon as the first fiddleheads appear, roadside entrepreneurs scour roadsides and other wetlands for the plants and then sell them by the pound at scenic turnouts, parking lots or even from their front yards. The best time to pick fiddleheads is when they are only a few inches off the ground, according to the University of Maine’s Cooperative Extension Office. As the fiddleheads age, they lose their potent taste, which some have described as a cross between spinach and asparagus. 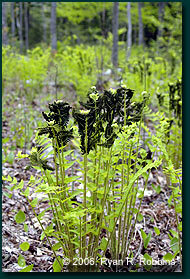 The immature ferns can be served alone, on toast or as a salad. You can even freeze them for up to six months. The ostrich fern is not edible once it unfurls, though. Fiddleheads slowly unfurling to show their true nature as ferns. For fiddlehead recipes, visit the UMaine Cooperative Extension office’s page of recipes. A word of caution about preparing fiddleheads for consumption, though: You should boil or steam them for at least 10 minutes. About 10 years ago a number of restaurant patrons in New York became sick after eating undercooked fiddleheads. Also, don’t confuse the ostrich fern with the bracken fern, a poisonous plant scientists believe is carcinogenic. The two species look alike from a distance, and their fiddleheads are similar. An easy way to tell the two species apart is to look at them when they’re mature. The bracken fern’s leaves have branches. The ostrich fern’s leaves have no branches and emerge from the ground as though they are in a vase. The ostrich fern is a cheap way for gardeners to complement their work, by planting the fern in front of unsightly brush. They require little maintenance, but plenty of water. So others can learn from the forest, do not pick any fiddleheads within the City Forest. 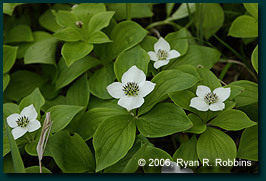 Found in large clusters carpeting the ground in forests in cool climates, the bunchberry appears in May with a white flower ranging in size from 1 to 1 1/2 inches in diameter. At the end of the summer, the flower gives way to red berries. The plant grows to a height of 3 inches to 8 inches, with most bunchberry in City Forest growing not much taller than 3 or 4 inches. Where to find it: primarily along East Trail, Squirrel Trail, Moose Trail. 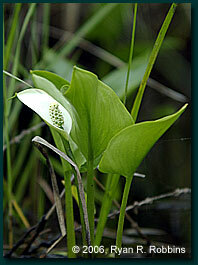 Wild calla, also known as water arum, is found in bogs and along the edges of ponds and lakes. The flower, which is in bloom from May through August, is about 2 inches high while the plant itself rises 6 to 12 inches above the water. The juices inside the plant are poisonous. Where to find it: along the Veazie Railroad bed, along the Orono Bog boardwalk. 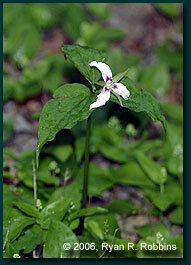 A member of the lily family, painted trillium is a perennial found in highly acidic soil and in bogs. The flower, in bloom from April through June, ranges from 2 to 2 1/2 inches across while the plant itself can be anywhere from 8 to 18 inches tall. Where to find it: in the woods on the edge of the Orono Bog. The most recognizable and ubiquitous flower in Maine, the common dandelion first appears in early May just about anywhere grass can grow. 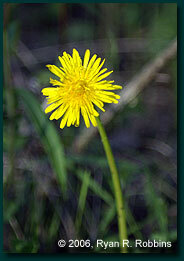 The flower is 1 to 1 1/2 inches in diameter while the plant can be anywhere from 2 to 18 inches tall. Where to find it: along any of the access roads, Veazie Railroad bed, arboretum, and clearing on Loop Road. 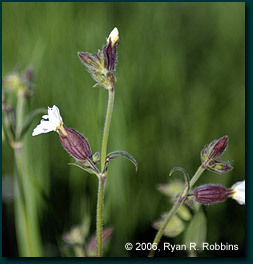 One to 3 feet tall, the white campion blooms from May to September in open spaces. At full size, the flower is 1 to 1 1/2 inches wide. Where to find it: near the end of Moose Trail, near Loop Road and West Trail. So named because Europeans used the flower to stuff mattresses in the Middle Ages, the yellow bedstraw grows to a height of 8 to 30 inches, with flowers averaging about 1/8-inch in diameter. It is in bloom from May to August. Where to find it: clearing along Loop Road. 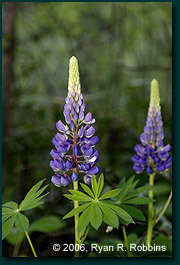 Regal with its straight and tall stem and bright purple color, the blue-pod lupine is one of the forest’s most easily recognizable flowers. The flower is in bloom from June through August. The stem is tall and hollow, ranging from 2 feet high to 5 feet high, while the flowers are about ½ inch long and clustered tightly at the top and wide at the bottom. The leaves feature nine to 13 leaflets arranged in a wheel pattern, with leaflets between 1 ½ inches to 4 inches long. Where to find it: along the Veazie Railroad bed, with several good specimens along the bed in the northeastern section of the forest. 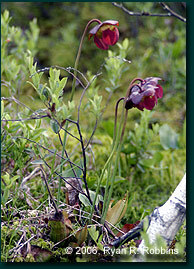 A carnivorous plant, the northern pitcher plant absorbs nutrients from insects that drown in the water held by the plant’s thick and short curved leaves that surround the single stem. The leaves secrete a sticky chemical that, combined with tiny hairs on the inside of the leaves, make it all but impossible for insects to escape from. The plant features a solitary purple-reddish flower resembling an umbrella that hangs down from the top of the plant’s stem, which can be up to 2 feet tall. 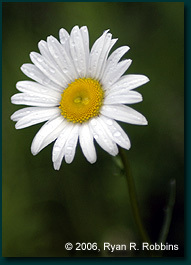 The flower contains five petals that are about 2 inches long. The leaves, at the base of the plant, are 4 inches to 12 inches long. The flower is in bloom from May through August. 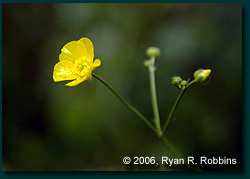 Also known as “tall buttercup,” the common buttercup features a tall, hairy stem containing branches at the end of which are the familiar flowers. Each flower contains five waxy yellow petals and is about 1 inch wide. The plant’s leaves, 1 inch to 4 inches long, are primarily at the base, with a few leaves near the top that are smaller. In all, the plant can grow up to 3 feet tall. It flourishes in moist, open areas. The flower is in bloom from May through September. Where to find it: along the Veazie Railroad bed and along the edges of access roads. A simple yet attractive flower with its white petals and rich yellow disk, the oxeye daisy is not native to America; it came from Europe. The plant features several stems that rise from a cluster of basal leaves and lead to a single flower head that ranges from 1 inch to 3 inches wide, with the white petals ½ inch to 3/4 inch long. The basal leaves are 1 ½ inches to 6 inches long, while the upper leaves are shorter. The plant, which ranges in height from 8 inches to 36 inches, is in bloom from May through October. Where to find it: along the Veazie Railroad bed, along access roads, along East and West trails, and in the arboretum. Perhaps the most recognizable flower in the wild, the broadleaf cattail thrives in wetlands and on the edges of ponds and other freshwater bodies of water. The plant, which contains separate spikes of male and female flowers, first blooms in May before fading in July. The male flowers are bundled at the top of the stem in what resembles a dull yellow spike. The female flowers are the brown cylinders. The male and female flowers grow to about 6 inches long. The male flowers shed their pollen and eventually become bare at the end of their season. 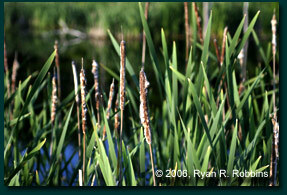 The cattail’s leaves, about 1 inch wide, form a long sheath around the stem of the plant. The stem rises anywhere from 3 feet to 9 feet above the ground. The plant provides a superb resting place for the red-winged blackbird. Where to find it: at the base of the former landfill, around the beaver ponds that extend from the arboretum to Main Road, the marsh that extends from the arboretum to the Veazie Railroad bed, along some stretches of the railroad bed, and even near the junction of Loop and Main roads. Often overlooked because of its short stature and tiny flowers, the azure bluet blooms from April through June in grassy areas on soil that is highly acidic. 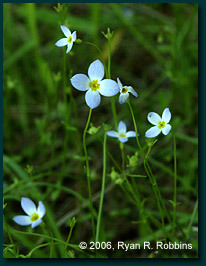 The flower, about ½ inch wide, features four light blue petals that surround a yellow center. Leaves extend from the base of the plant and are up to ½ inch long. Leaves along the short stem, which measures no more than 6 inches, are much smaller. Where to find it: Squirrel Trail, off Main Road. 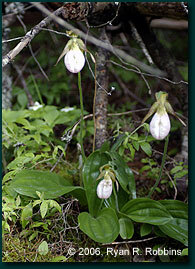 A simple yet elegant orchid, the pink lady’s slipper is also called the pink moccasin flower. It features two large basal leaves that are about 8 inches long. The leafless stem rises anywhere from 6 inches to 15 inches above the forest floor. The flower itself hangs from the stem. It is pink, about 2 inches long, with a slit in the middle, from which the flower gets its name because it resembles a slipper. The flower is in bloom from April through July. Avoid touching this plant because it contains chemicals that can cause a rash similar to that of poison ivy. Where to find it: Skunk Trail, Lynx Trail, Moose Trail, and along the peripheral trail Ledge Trail. 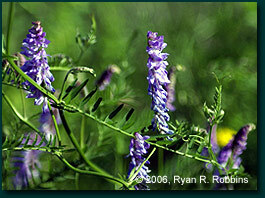 First appearing in late May and in bloom through August, cow vetch, also known as purple-white tufted vetch, features racemes that contain up to 70 small purple flowers the size of small peas. The plant itself grows by coiling around unnatural objects, other vegetation, and even itself, with the racemes extending from stalks that come out of the plant’s leaf axils. 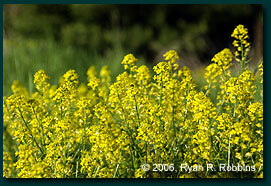 The main flower, which includes all of the pea-sized flowers, measures anywhere from ½ inch to 3/4 inch. The plant’s leaves are 3/4 inch to 1 ½ inches long with eight to 29 pairs of smaller leaflets. The tendrils, which the plant wraps around objects as it grows, come out from the end of each leafstalk. Fully grown, the cow vetch will be 4 feet to 7 feet long. This plant contains cyanide and is poisonous. Where to find it: the arboretum, along the Veazie Railroad bed, along the access roads where there is constant sunlight. 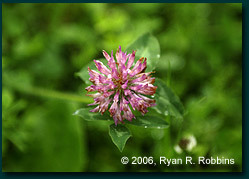 Almost as common as the white clover, the red clover can be found in the same areas. The hairy stem rises 6 inches to 36 inches above the ground. Three oval leaves, 3/4 of an inch to 2 ½ inches long, surround the deep-pink flower head, which can either be egg-shaped or round. The flower, embedded in a head that is 1 inch long by ½ inch to 1 ½ inches wide, is about ½ inch long. Where to find it: along access roads, along the Veazie Railroad bed, anywhere there is grass. 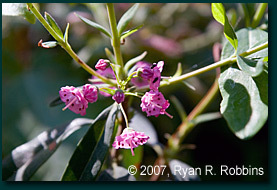 Named because of its poisonous nature to sheep and livestock in general, sheep laurel is also called �lambkill.� This shrub, with its bright-pink umbrella-shaped flowers with red spots, can grow in bogs, fields, and in dry or wet environments. The flowers are between 3/8-1/2 inches wide with five petals and 10 stamens. They bloom from May through August. The shrub�s leaves are between 1 1/2-2 inches long in groups of three and are dark green on the top and pale green underneath. The entire shrub matures at 1 foot to 3 feet. Where to find it: along the Orono Bog boardwalk, along Fox Trail, and here and there on the western side of the forest couched between Quinn and West trails and the Veazie Railroad bed. 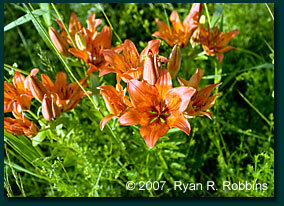 In bloom from June through August, the vibrantly orange wood lily prospers in meadows and forests. The flowers are 2-2 1/2 inches wide and feature six petal-like segments that are bright orange or red on the top and a pale orange to yellow at the bottom with purple spots near the base. The leaves are 1-4 inches long and narrow. The plant stands at a height of 1 foot to 3 feet. The wood lily was once abundant throughout North America. Unfortunately, people enamored with its beauty are unwittingly contributing to its demise by picking its flowers. Doing so kills the entire plant. Where to find it: in the arboretum. � 2001-2011, Ryan R. Robbins. All rights reserved.